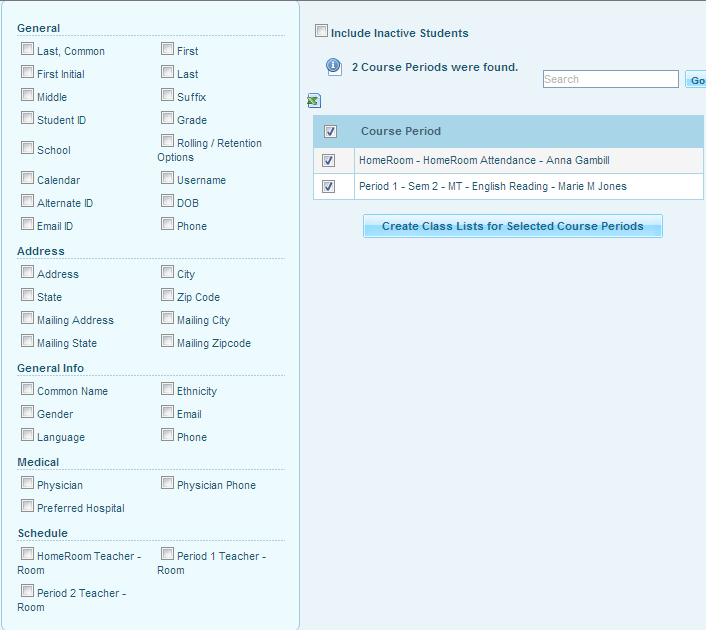 Using this option teacher can generate Course Period specific class information report. To create it go to Scheduling >> Reports >> Print Class List. A screen will appear with Student's General, Address Medical sections at the left and at right you get the Course Periods to select from. Select the details for the students that you would like to see on the report and also select the course periods and click on Create Class Lists for Selected Course Periods. This report generates a teacher's classroom pictures of students in a print form. To generate the report go to Scheduling >> Reports >> Print Class Pictures. Here, a list of course periods with the teacher appear. You may include the teacher as well in the classroom pictures by checking the Include Teacher option, select the course period and click on Create Class Pictures for Selected Course Periods.